I get to test AWESOME products! This time around I got to review Purex Crystals fabric softener. up in the wash with the crystals! Before I give you my review of the Purex Crystals and the Jockey sports bra let me give ya some facts about the products! The more natural way to freshen your clothes for weeks not days. Purex Crystals are 92% natural crystals that go in at the start of the wash so they spend more time with your laundry infusing them with long lasting freshness. Normally you should not use fabric softener on performance sportswear because the oil content prevents the wicking process. That's why we are so excited about pairing it with the 2012 Purex Crystals! My review~ I wanna first tell ya that the smell of the Purex Crystals, it is just wonderful! My laundry room is the best smelling room in my house after a load of laundry with the Purex Crystals! I received the Tropical Splash scent! It smells like a tropical island and makes laundry not such a bad chore with the great smell. It left my towels and blankets fresh, fluffy and smelling great until I had to wash them again! I wash sheets and blankets once a week unless there has been a accident or something that requires me to wash something immediately. The Purex crystals are so easy to use and come with a measuring cup that snaps to the top of the bottle. You add the Purex Crystals to the wash at the beginning of the wash cycle with the laundry. I like that I don't have to watch the washer to add the softener at a certain time. The Purex Crystals are so convenient! All my laundry is so soft and smells great and as a busy mom that's perfect! It makes me feel good to have great smelling laundry! I give the Purex Crystals a 5 out of 5 for smell and convenience! The Jockey Sports bra help up very well even after 5 washes! The picture below of the sports bra is after 5 washes in with the Purex Crystals! It kept its shape and fit the same way it did when it first arrived! There are no signs of wearing, you know how you get those fuzz balls on most bras after a few washes and they look old and worn out. I don't have that with my Jockey bra! I do suggest that if you purchase a Jockey sports bra to get a size bigger than you normally wear, they seem to run a bit small. Other than that I give the Jockey sports bra a 4.5 stars out of 5! I like Jockey but I want the Purex crystals. I've tried the crystals before and they are awesome! I would love the sports bar! I like both but LOVE the Purex crystals...they smell awesome and we have grown to use these all the time. Without them, well...now we are lost because they make our laundry smell terrific and we can tell the difference without. I would love to win both! The Jockey sports bra has so much support. But, if I have to choose one, I will choose the Crystals because I love how they make my laundry smell. I just entered for my chance to win! Visiting from the Alexa hop! FYI - on Thursday www.busymomonthego.com is going to have a link-up list for bloggers to market their blog at the end of our "50 Ways to Save in 2012" post. Make sure to stop by for a visit and a link-up!! I'm anxious to try the Purex crystals. I can't get your rafflecopter work... but the coupon is for 20% off and I entered your other giveaway! I really want to try out the purex crystals as I have seen but not tried them yet! I'd love the sports bra. The Jockey Sports Bra is most appealing to me! I'm on a workout kick, so I'd love the Jockey bra most! I would love the Purex!!! I would love the Purex! but I like both. I'm most excited to win the Jockey sports bra. I can always use a new bra! my daughter would prob use the sports bra, but i would love the purex crystals, but i cant get your rafflecopter to work! I am a runner in great need of a new sports bra! I am most excited to try the bra. couldn't leave it in box?!?!? I want to.try the.crystals I think I would love them, plus the sports bra would be great too!!!! Both but I love purex crystals ....ive never seen the yellow bottle before, we only have blue and purple available in NC. I'm excited about both, but I really, really, really need a new sports bra, so I'll go with that! Couldn't get the first button to work when typing in the percentage..which is 20%. I would love to try the crystals!! I want to try the Purex crystals most! I would love to win and try the Purex crystals. And, I need a new sports bra! I really like the Purex crystals the most. I want to try the scent crystals in my bed sheets and blankets. I'm always trying to find something to smell good to sleep in. 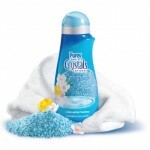 My daughter plays soccer and would love the sports bra and I love the scent of the Purex crystals! win win for both of us! I'm most excited about winning and trying a Jockey sports bra. Want to try the new Purex!